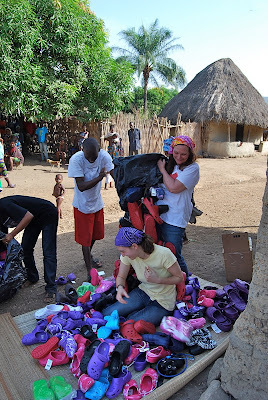 Once all the medications were given out at Kamasorie Village (we distributed to 3 villages that day), it was time to sort and give out the shoes. 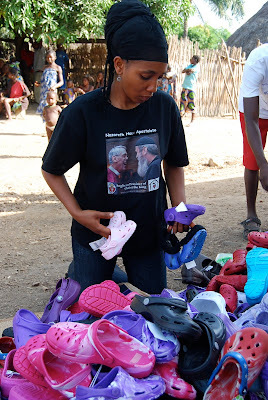 We had given out more shoes the day before at the Nazareth House Apostolate School in Kabala. Here we are today ready to give out more. We can't thank everyone enough for their participation in this collection drive. You did well! The shoes were carried over to the area in which we would distribute them. for their proud new owners. 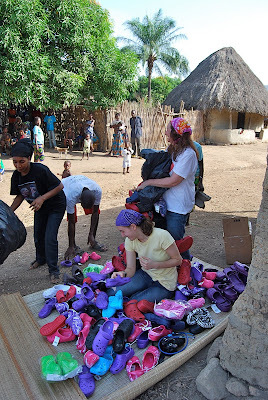 In a village where no-one gets anything brand new; everything - shoes, clothes, etc - is used (and most of the time not "gently" used but vigorously used), getting brand new shoes is a big deal. A very big deal. 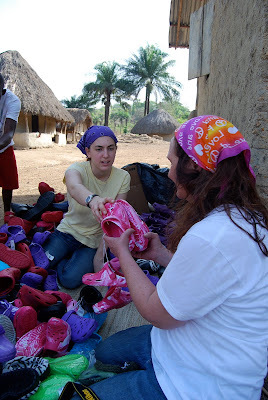 Emily quickly initiates the task of sorting the shoes by sizes. 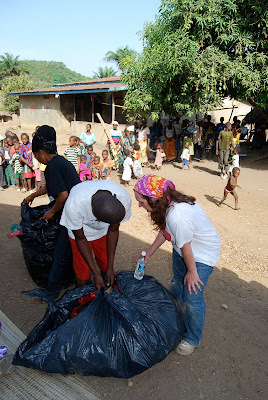 Pa Foday, Kadijah and Mako begin opening the large black bags and boxes filled with shoes. 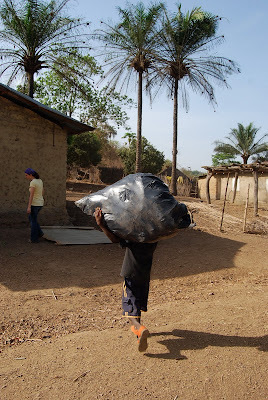 These are the very bags filled with shoes that they carried on their heads to reach the this village, hiking 4.8 miles. My mischievous nature is sparked when seeing Emily sitting on the ground surrounded by shoes. I decide its time for a little fun. I whisper to Mako about my plan and being the fun loving guy that he is, he quickly agrees to join in. as we dump all the shoes directly on her. appreciate the prank, but work is quickly resumed. The shoes are sorted by size. that is characteristic of Nazareth House. We never pull up in a truck, dump off supplies and leave. We work individually, building a relationship. As with the worm pills we take the time to administer each dose to each person. We fit each shoe on each child, making sure it fits the best it can. Oh sure, some shoes had growing room for some kids, we could not have 100% perfect fitting. But we came close. a line begins to form with anxious children. surrounds the building in which we are in front. and we are ready to match the shoes to the feet. Check back tomorrow to see the "fitting of the shoes". Be a part of Nazareth House Apostolate, its not just an organization helping out others, its a family; sharing, laughing, loving together, doing the best we can for each other with what we have. Thank you James for documenting the work, the fun, the family. What a great photographer you are. I love you.